My dining room table was just a little too wide for the dining room. Whenever I was at the table and our German shepherd wanted to go outside through the French doors in our dining room, the door would hit the back of my chair. It was annoying. One solution would have been to switch seats. Or, I could have taught the dog to not go out during mealtime. Instead, I decided to make new table that was just narrow enough to allow the door to swing clear of the back of my chair when I opened it for him. My wife is a craftsman-style furniture fan. I prefer Shaker style. One solution would have been to find a new wife who shares my aesthetic sense. Instead, I decided to build a craftsman-style dining room table for her. The first photo shows the end of the table and the trestle. I designed the center slats in the trestle to match the back splat of a set of chairs that I plan to build to match the table. The second photo shows the table in side view. (You can also see the top of our old dining room table against the wall on the right.) I built the table from some spectacular white oak that I purchased at Edensaw Woods, a hardwood supplier about two hours, including a ferry ride, from my house. 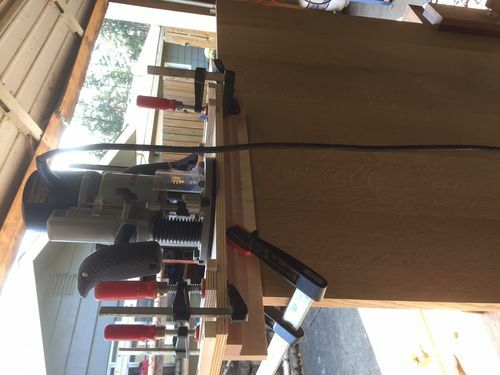 I constructed the legs using four quartersawn boards joined by lock-miter joints (photos 3 and 4). I attached the table legs and the bottom stretcher to the bottom rail of the trestles using through mortise and tenon joints. The stretcher beam was a little awkward to handle on the table saw so I cut the tenons by hand. It gave me a chance to use my miter box and tenon saw. 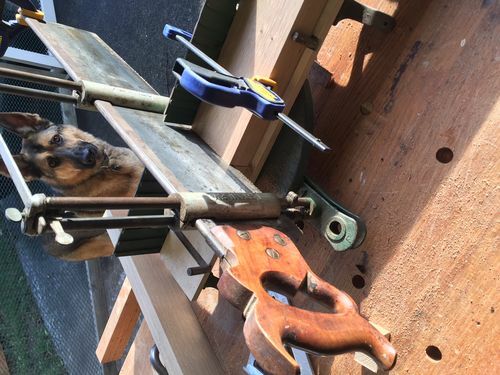 The dog that inspired this table seemed particularly interested in the miter saw. 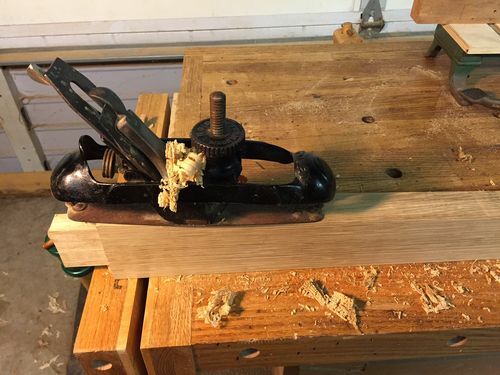 To cut the motises I made a plywood jig with an opening the same size as the mortise and after removing most of the waste at the drill press I cut the mortises with a bearing-guided router bit and then squared the mortise corners with a chisel. 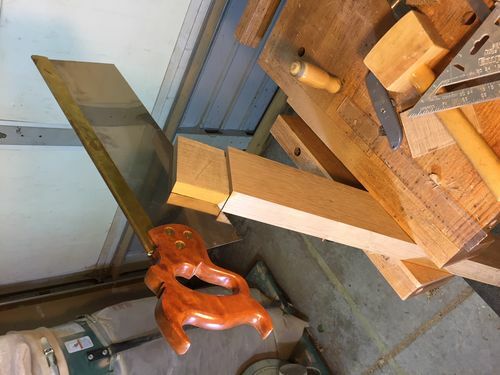 I used a band saw to cut the arcs in the trestle bottom rails and the stretcher and completed the arc using a compass plane from a second-hand shop. This was my first time using this plane and it worked like a charm. The tabletop had breadboard ends. 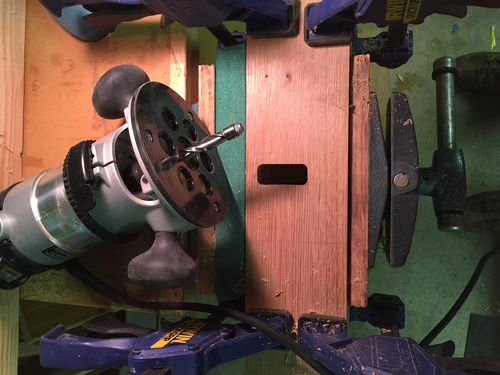 I did not have long enough material to cut tenons in the ends of the boards so instead I cut grooves for splines and mortises for loose tenons using a router with a guide bushing and plywood jig. 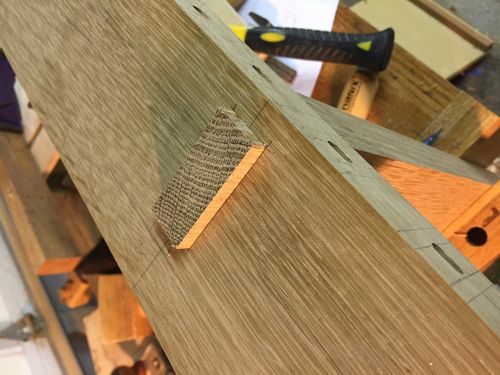 I glued these in place and routed matching mortises and grooves in the breadboard ends using the same jig. I glued the middle of the center tenon to the breadboard end and attached the other tenons by draw-boring the joints. 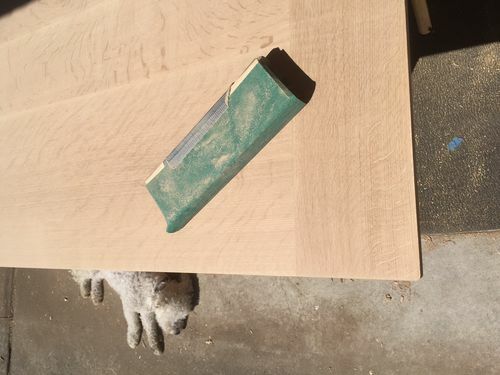 After a lot of planing and sanding, I was nearly as tired as our little white dog. To finish the piece I first applied a liberal coat of boiled linseed oil. Once dry, I sealed the wood with two coats of blonde shellac. Next I applied General Finishes Brown Mahogany Gel Stain and then immediately wiped the excess until the surface was clean. That stain is terrific. It filled and darkened the pores, gave the surface a nice brown color, and popped the medullary rays. After another coat of shellac, I applied a bunch of coats of an oil-varnish mixture (tung-oil, boiled linseed oil, wipe-on polyurethane), sanded between several coats, and finished the top with satin wipe-on poly and a coat of paste wax. After finishing the base I screwed and glued a piece of oak plywood to the aprons to keep the base from racking and to provide a large surface for attaching the tabletop. The table is just the right size for our dining room. And the back door no longer smashes the back of my chair when I open it. Now if I could just convince the German shepherd to leave me alone when I’m eating. Very nice, the rays in that beautiful wood really stand out, you did a great job. Dave. A great job building and designing your table. I love white oak and you did a great finish to bring it out as well. This is a project to enjoy everyday you sit down to eat! The craftsman style furniture build was a wise choice. Excellent work. Very beautiful wood, the grain matching, and design. I had a good laugh at the markings and arrows above. My wife never could understand why I did that. Congratulations for a great table. Very nice work. Thanks for the construction pictures and descriptions! Beautiful piece. I am sure your wife loved it. The breadboard construction looks great. Looks solid as a rock, nice work! What brand bit did you use for the lock mortices? 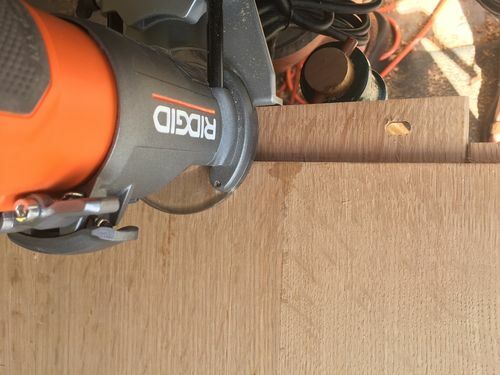 Splintergroup – I used a Rockler lock-miter bit for the miter joints. It comes with a set-up block that makes it easy to set the bit height. And yes, building a Craftsman-style table was much easier than finding a Shaker wife, especially when you consider that the Shakers did not believe in marriage or procreation. Dave, superb qswo, especially since you are on the west coast, I didn’t know you could get stock that nice. Excellent craftsmanship and design as well, its all good. Very nice work Dave your wife must love it.Beautiful! Wonderful project. Thanks for sharing the process. The arts and crafts and shaker style will always be in style. It’s such a classic piece. Fine example of great craftsmanship. I’m having the same problem of sideway pictures from my iPhone. Another LJ suggested cropping the photo a tiny bit and it will correct that. Was there much sawdust created during the making of this project? Where did you buy that beautiful QSWO. I’m also from so. Ca. Does the German Sherperd approve of the new clearance?